I lived a charmed life…a wonky one…but a charmed one. This page is devoted to the recent recognition I’ve received as a writer and blogger. I’m just trying to give any agents and editors a quick and easy place to verify that I’m the gal with the fresh voice they’ve been looking for. I published my second book, a novel based on true events, called Never Turn Back, in the Fall of 2014. I don’t know if I have another book in me. Writing is a very expensive hobby in every way. My first book (yes, there’s more where that came from), How Was I Supposed to Know? The Adventures of a Girl Whose Name Means Lost, won Best Memoir of 2012, Adirondack Writing Center Literary Awards Annual Contest. It is a region award, but an award nonetheless. For my story Behind the Mask, I won a writing competition sponsored by a fellow blogger as part of her Seven Deadly Sins Essay Contest. The essay was about the sin of envy, of which of have none unless you’re talking about newly discovered writers from quirky blogs who publishers are getting into bidding wars over just to have a shot at publishing her memoir and selling the movie rights to Hollywood. I’m a little envious of those writers. I won “Honorable Mention” in the Memoir/Personal Essay category (one of 10 categories) of the 80th Annual Writers’ Digest Writing Contest, a national (if not international) writing contest. “Monkey Business” was selected out of 11,800 entries to be one of the 100 top entries in that category. While only blogging for 7 months, I was nominated for Dark Globe’s 2011 Outstanding Artist, Blogger of the Year. I won that competition in a three-way tie. I’ve been nominated more than 10 and less than 20 times for the Versatile Blogger Award, a peer award since I’ve been blogging. The first time was two weeks after Lorna’s Voice debuted. 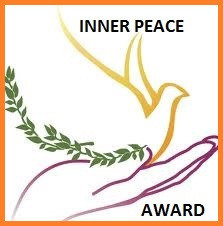 I received the coveted and beloved Liebster Award five times, another peer award. The Readers Appreciation Award was bestowed on me once, and it’s a one-time-only award, like being knighted or losing your virginity. 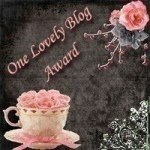 I am now the recipient of the One Lovely Blog Award twice over. This, too, is a peer award, and is, I think, quite lovely. 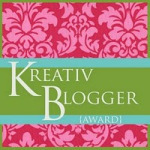 The Kreativ Blogger Award was also bestowed upon me several times. This is quite an honor because it’s not everyday that you can just change the spelling of a word unless you’re a hair salon (“Kreative Kuts”). 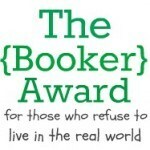 My blog has won the prestigious Booker Award, but not the prestigious Booker Prize. It’s amazing what a difference one word can make. But still, I’m honored. 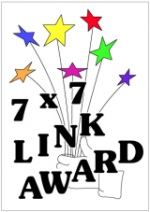 I was also given the 7 X 7 Award, which is a snappy little award that is nice to have because it looks so festive on my award wall. The Rudolph Award is another peer award given to just two bloggers who are tremendously supportive. This is a special award because it blinks. The jolly LOL Award that sports a bouncing smiley face shows just how funny some people think I’m trying to be. The Very Inspirational Blogger Award must have been given to me for either my quilt art or my lame attempts at poetry. But it worked. I’ve received it twice. 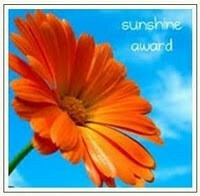 Both the Sunshine Award and Candle Lighter’s Award are very nice awards for people who like it bright. Since I prefer shade and dark, these awards must be metaphors. The Beautiful Lipstick Award is another blogging award I can add to my list. I figure this blog award is like a cyber-smack on the lips, don’t you? 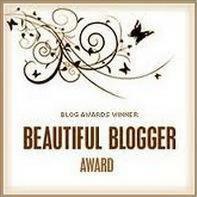 Speaking of beautiful, I was also granted the Beautiful Blogger’s Award. How much glamour can a girl stand? In 2012, a 6-starred banner was making the rounds. It was deemed the 2012 Blogger of the Year Award and a blogger could receive it multiple times. Actually part of the fun was seeing if you could get all of the stars filled in gold. I did! 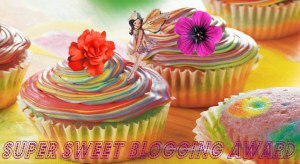 I’m a six gold star gal, thanks to my blogger buddies! 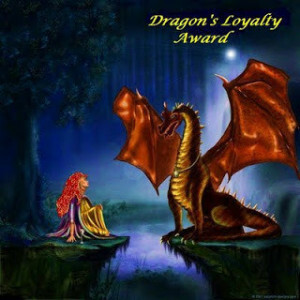 The Dragonfly Award for Loyalty was bestowed upon me for doing what bloggers are supposed to do: keep in touch with each other by reading and commenting on each others’ posts. 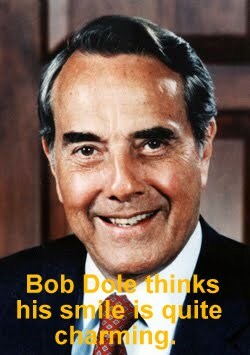 It’s just the neighborly thing to do. Um, this award seems like a no-brainer. Blonde, blue-eyes, Buddhist. I was a shoe-in. 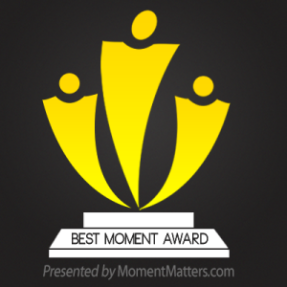 I don’t know which Best Blogging Moment I got this award for. I mean, there are so many. Just look at the page of “Lorna-isms” I’ve collected. 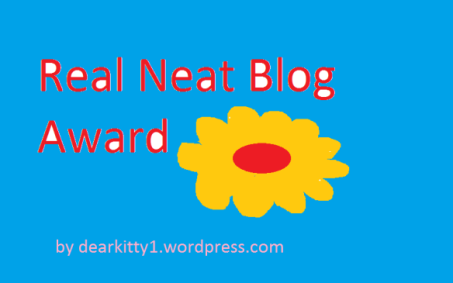 This Super Sweet Blogging Award is totally ironic. I don’t eat sugar. Maybe it’s from all the years when I downed fluff and frosting like popcorn during a scary movie. I hope I give other bloggers a sense of inner peace. I sure have been looking for it fora long time and all I’ve gotten was dove poop on my palm. But I hear that’s good for erasing age spots. I have an extremely loyal and sublimely talented growing cadre of blogger/writers/creative souls who follow me regularly, as shown by the number of subscribers, comments, and visitors to my blog each day. They all think I have talent and that I’m a nice person, to boot. Animals, who don’t buy books but are great judges of character, also love the dickens out of me. I’m Buddhist, and that has to count for something. 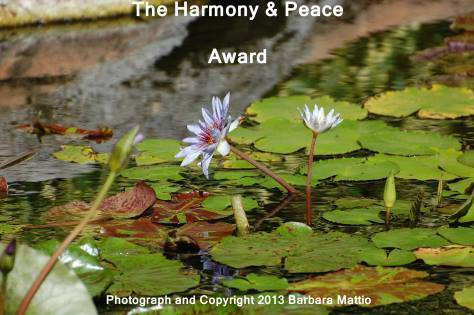 I am the recipient of the Peace and Harmony Award. I really can’t let this one go to my head. My Buddhist membership card will be revoked. Someone finally recognized how really neat, nifty, and keen my blog is. And it only took, like four and a half years! Lorna will keep writing her life story and, eventually compile it into an oddessy autobiography memoir collection of stories in a loose-leaf notebook. She will also seek help for her newest symptom, illeism: the insistence on referring to oneself in the third person. It’s very annoying. I have recently had the pleasure of completing and publishing my first, and most likely only, book, Go on Dad…Knock. Its a memoir about my quest to find my family. I’d spent best part of two years kicking it about and turning it into something like a book, granted with a little help from some local professionals here, in Liverpool UK. It was a no brainer, I asked her basically to do ‘all the things that she does’ to help me turn my book into (In her words) the best that it can be. Before long I had an ally, a new friend, and we laughed and joked our way through the process, whilst always respecting the serious business of producing an ever improving piece of work. What was previously a burdensome process became fun, objective. There was always something positive to work towards. Lorna pointed out detail that I had missed, she had such a clear vision of where we needed to go, and her gentle and fun comments always led to a further layer of polish as the project developed. She seemed to grasp what I was doing better than I did myself, and having her ‘by my side’ proved invaluable. Lee who kept her promise, and from afar, helped my book become ‘The best that it could be’. Thank you my friend. Ron Clark. All joking aside here, for a moment. I am almost finished with this great read and extremely impressed with so many aspects to it; the most significant was that personally I loved it and didn’t want to put it down. That actually surprised me, because I wasn’t expecting to like it that much, that’s how well written it is which for me (not that I’m anyone special but my viewpoint is the only one I have) is something considering it’s a memoir of a woman I don’t know but by the time I arrived at the last chapter not only do I feel I know and care about her, I really really like her. Where it really excels, and not many authors can succeed at, is the wit, the humor Lorna (you) interject, into funny aspects, poignant aspects, etc. I’m so impressed and will be writing an official review for Amazon etc. but for now I couldn’t wait to let you know all this. Kudos to you for this great book and hope it succeeds to the moon. AGENTS/PUBLISHERS take note. 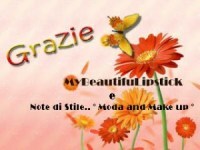 Paulette (if you want to know who Paulette is, just ask-it might heighten the impact of my words here). I wrote this page a long time ago and keep updating it when I get a new award or something notable happens in my writing world. Keep checking back! Am I missing something? Are our posts dated somewhere? I have no idea when you wrote this, but it’s damned funny! Lorna, something for you here.